Lucchini, Gallmann, Keller, 25.8.2016 :: NCCR MUST :: Is there a material limit for high-speed electronics? Is there a material limit for high-speed electronics? The possibility to manipulate the electrical properties of matter with very short optical pulses is a fascinating field of research with possible far reaching applications in many relevant technological fields. Of particular interest is the interaction with short and intense pulses for which the photon energy becomes comparable to the cycle-averaged kinetic energy of the electrons in the field. In this regime the optical response of the material transit from a classical to quantum description, many intriguing effects exist and the role of inter and intra-band transitions is not clear. One remarkable example of a phenomenon in this mixed regime is the dynamical Franz-Keldysh effect (DFKE). Due to the interplay with other field-driven effects that take place for intense driving fields, DFKE has so far been observed only around the energy gap of dielectrics and on the picosecond time scales. Matteo Lucchini, Lukas Gallmann, Ursula Keller and co-workers have used transient absorption spectroscopy (ATAS) to study the optical response of polycrystalline diamond driven by few-femtosecond, intense infrared (IR) pulses. Ab initio calculations performed in collaboration with the group of Katsuhiro Yabana (Tsukuba University, Japan) by coupling time-dependent density functional theory (TDDFT) in real time with Maxwell’s equations reproduced the experimental observations. Further comparison with a numerical two-band model showed that the DFKE (intra-band motion) is the dominant mechanism in this regime. 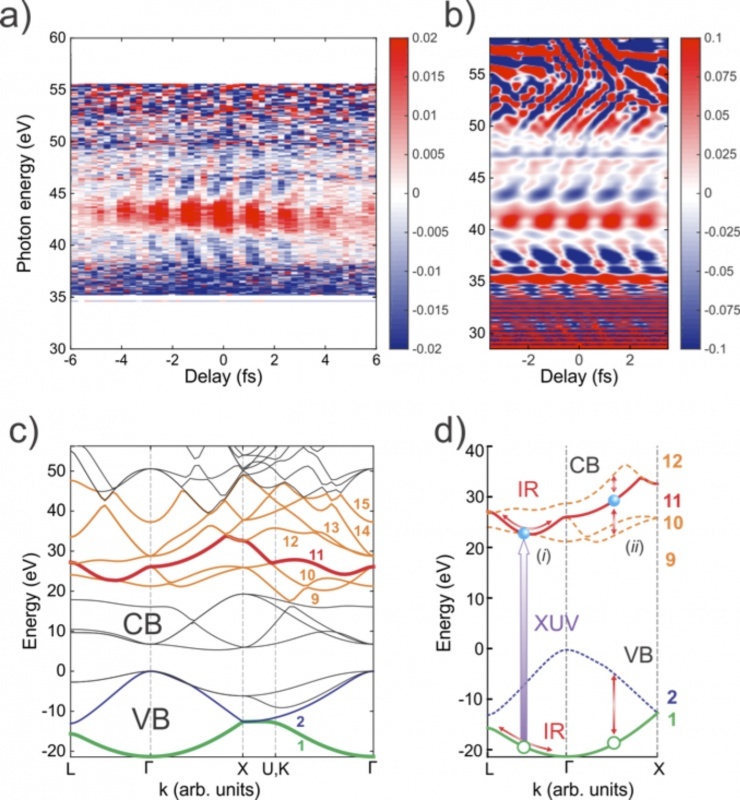 The reported results constitute the first observation of the DFKE in the high-energy part of the conduction band of dielectrics and in the few-femtosecond regime. These findings indicate that the reaction of the material to the optical field is dominated by intra-band motion of the electrons rather than by transitions between different sub-bands. In similar experiments the relative importance of intra- vs. inter-band effects had been unclear, but the experiment at ETH has now settled that question. The reported analysis constitutes an important step towards a full understanding of optical properties of dielectrics in a nonperturbative regime. Furthermore, the results demonstrate that the high-energy part of the CB can be virtually populated by few-femtosecond IR pulses in a fully reversible fashion. Thus obtaining optical control of the charge carriers on a sub-cycle time scale or in other words at petahertz frequencies. The experiment thereby tests the ultimate speed barrier for the control of electrons through electrical fields in solids, which is essential for finding potential fundamental performance limits for future high-speed electronic devices. Figure 1: a) Experimentally measured infrared-induced absorption change measured in the extreme ultraviolet and with a 50-nm thick polycrystalline diamond sample. b) Calculated induced absorbance for a 50-nm diamond film. c) Band structure of diamond. The main sub-bands involved in the optical response are outlined with different colors. d) Schematic drawing of the two main mechanisms responsible for the appearance of oscillating features in the recorded transient response: (i) intra-band motion and (ii) inter-band transitions involving the 1st and 11th sub-bands. Reference: Lucchini, M., Sato, S. A., Ludwig, A., Herrmann, J., Volkov, M., Kasmi, L., Shinohara, Y., Yabana, K., Gallmann, L., and Keller, U. (2016). Attosecond dynamical Franz-Keldysh effect in polycrystalline diamond. Science 353, 6302, 916-919. DOI: 10.1126/science.aag1268, Lucchini-2016 (1.87 MB). ETH news: "Electrons at the speed limit"
ScienceDaily: "Electrons at the speed limit"
Nature World News: "Speed Test of Electrons at Unbelievable Levels Lays Groundwork for Next Wave of Electronics"
EE-Times Europe: "Swiss researchers investigating petahertz electronics"